After being completely redesigned for a new generation, the 2017 Honda Ridgeline took home the North American Truck of the Year award. This is the second time this Central Illinois favorite has earned such a recognition from North American automotive media and critics, and we want to share with you just how the Ridgeline impressed them. A group of more than 50 North American auto media members gathered to select their truck of the year to present at the opening of the North American International Auto Show in Detroit. It wasn’t just a popularity contest; they rated vehicles on design, handling, safety performance, innovation, driver satisfaction, and overall value. And they decided on the Ridgeline. A group of journalists from a wide variety of publications, across radio, television, and the Internet, selected Honda’s pickup above its competitors. With one look at the details of the Ridgeline, we think it’s easy to see why. Now that you know what’s needed to earn North American Truck of the Year, here’s a look at how the Ridgeline did it. Trim Levels: With seven distinct trims to choose from, the Ridgeline ranges from advanced work truck to highly capable, luxurious tailgating machine, covering all the spots in between. Engine Specs: Under the hood of each model is a 3.5L V6 rated at 280 hp and capable of towing up to 3,500 pounds (5,000 pounds on all-wheel drive models). Features: With standard features like Bluetooth HandsFreeLink, a multi-angle rearview camera, a lockable in-bed trunk, and a dual-action tailgate, the Ridgeline has an edge over so many trucks. This wasn’t the 2017 Honda Ridgeline’s first award, either. 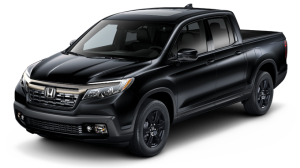 The Insurance Institute for Highway Safety recognized models equipped with the Honda Sensing safety features as some of the safest vehicles on the road, earning the Ridgeline’s Top Safety Pick+ award. Honda Sensing includes Collision Mitigation Braking, Road Departure Mitigation, Adaptive Cruise Control, and more. You can get an idea of what makes the 2017 Honda Ridgeline an award-winner just by looking at its features and specs, but you should sit behind the wheel before trying to decide on a trim level. Visit a Central Illinois Honda Dealer near you today for your test drive.